All during the Trump campaign every speech included his promise to build a wall on the southern border. As President, he continues to vow to build it. Of course, the Democrats hate the idea and argue that it would not be effective and would cost too much. The history of walls is long and rich. Perhaps the oldest are the walls of Jericho, but certainly the most famous is the Great Wall of China. Built beginning during the reign of Emperor Qin Shi Haung in 259 BC and continuing for centuries the wall spanned 5,500 miles. Originally conceived to keep out the marauding tribes from the north it also served to collect taxes and fees from the Silk Road trade. England/Scotland border. The purpose was to keep the crazy Picts from terrorizing the more civilized folks to the south. Numerous examples of successful walls exist but a couple more include the wall around the Kremlin and the wall completely spanning Manhattan Island built by the Dutch to keep out the Native tribes. Guess where the name “Wall Street” came from? Most walls are intended to keep the enemy out, but the Berlin Wall was intended to keep its citizens inside. The lure of the modern and prosperous West Germany served as a great motivator for the captives to escape the misery of East Germany. People risked their lives and often lost them in trying to escape. North Korea also built a wall to keep its hapless citizens inside at the DMZ separating North and South Korea. Two recent examples are the West Bank Barrier between Israel and the Palestinians on the West Bank. It has been very effective in nearly eliminating the terrorist attacks. More recently, the Hungarian Border Wall has been constructed to stop the flood of migrants from Syria and Africa that are inundating Europe and threatening the culture of European countries. The argument that the wall would cost too much does not make much sense either when compared to the cost to society for all the costs of supporting the illegals like educating illegal youth, health care and welfare, not to mention crime. The Trump/GOP tax plan that was just enacted has prompted Apple to repatriate some $250 billion dollars. They are paying an additional $48 billion in taxes on that money. Part of that windfall would make a nice down payment on a wall. We can never know how effective these ancient walls were in achieving their purpose but the modern examples; Berlin, West Bank and Hungarian were very effective. 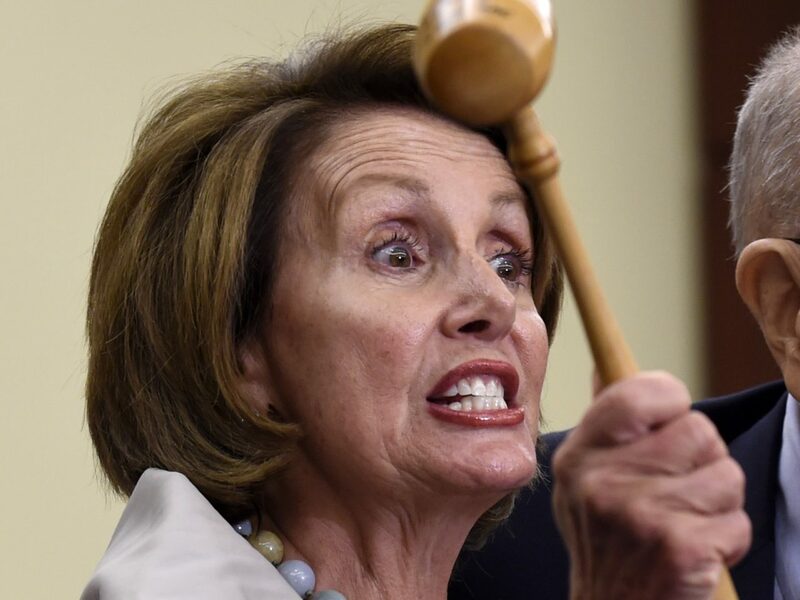 The Democrat argument that the wall will do nothing to retard the flow of illegals and drugs across our southern border is self-serving at best. The truth is Democrats cynically want illegals because they are counting on them to become loyal Democrat voters. When your boat has a leak far from shore it makes sense to try to stop the leak before bailing. Otherwise, you fight a losing battle. The fact that some of these yahoos have been deported five, six or more times suggests that the leak is pretty serious. Build a wall to stop the leakage and then start bailing some of the undesirables out. Donald Trump came to Washington to “drain the swamp”. He’s finding it extraordinarily difficult to get it done. It turns out that the denizens of the swamp are fighting desperately to prevent it. And why not? It is one sweet deal for the swamp dwellers. The four counties surrounding the White House are the wealthiest in the nation, surpassing LA and NYC. According to the NYT (5/12/17) there are 34 billionaires within a 25 mile radius of downtown and 2,049 residents worth more than 30 million, 45% of the workers earn more than $100,000 per year. So who are these people and what do they do? According to Atlantic Monthly (12/18/13) they are lawyers, defense contractors, doctors and computer geeks. Mostly, they are lobbyists. In 2017 there are 34,700 registered lobbyists in Washington and among them 4,000 tax lobbyists. They represent everything from large multi-national corporations to non-profits, unions and every manner of special interest groups. Money is the lubricant that keeps the Washington machine running and there is lots of it devoted to lobbying. In the last decade corporations spent $14.4 billion and $2.4 billion on tax lobbying. The revolving door of government…. Retiring from government office and turning to lobbying your former colleagues can prove to be a very cushy retirement program indeed. Former Senators Breaux and Trent Lott put together a little lobbying team and netted $39.6 million in fees since 2008. The Podesta Group pulled in $32.3 million and former White House Chief of Staff Ken Duberstein a piddling $29.2 million. 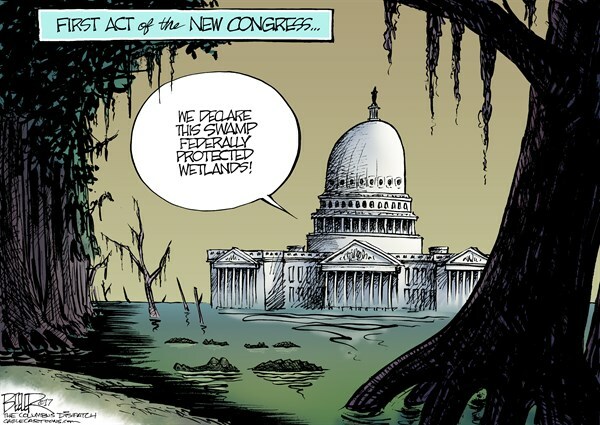 Congress is the other major group that does not want their comfortable swamp existence disturbed. There are 53 members who have held office for more than 40 years. Democrats have the distinction of having the top 17 with the longest time in Congress and despite having an approval rating with the public that is consistently around 10%, most get re-elected at an unbelievable rate. In the Senate it’s generally 90% and the House in the high 90s with 98% not uncommon. So why would these guys fight to stay in office for what seems like relatively modest pay ($174,000 per year)? Simple. It’s the other stuff. First, they get 239 days off. (Yeah, I know. They are back in their districts serving their constituents or maybe servicing their interns.) They have a generous allowance to manage their office and pay their staff. House members all receive $944,671 per year for this while Senators have an average of about $3 million. It’s slightly less or more depending on the population of the state. Of course, there are other perks such as free gym, free deluxe parking at Reagan International (annual cost to taxpayers $740,000), many free flights and subsidies of 72% for health care under ObamaCare. Ever wonder why they are not too enthusiastic about repeal? Retirement program is pretty nice too. Members need at least five years of service and must be at least 62 years old to receive a pension or 50 years old with 20 years of service. Depending on the number of years it can be up to 80% of their base salary. The biggie though in my opinion is the weakened insider trading rules for members of congress and their staffs. For years members could trade in stocks with inside knowledge. How do you think all these guys become millionaires? For example, a CEO is having lunch with a member of congress ostensibly discussing a certain tax break that would benefit his company. He “accidentally” lets it slip that he is going to announce the takeover of a rival company meaning the stock price of that company is going to go up. The Congressman quietly buys shares of the target company and bingo, quick profit. Same deal and even more lucrative in the case of initial public offerings. In 2012, an election year, Peter Schweizer, who had authored a book called “Throw Them All Out” went on 60 Minutes and exposed this scam. An embarrassed Congress publicly passed the STOCK Act to prohibit this practice. After the election they secretly and very quietly pulled the teeth of the restrictions and it was back to business as usual. I guess if you’re a member of congress that’s been around for 40 years and some bombastic businessman comes in a says he’s gonna drain the swamp you would probably just say “why?” If they had wanted it drained they’d have done it already. Of course the Democrats are not going to vote for anything proposed by Trump. They have been on an unbelievable losing streak for a long time now and with the same leadership cannot imagine doing anything differently. Also, they still cannot believe Hillary lost but bitterness is not a policy prescription. Many Republicans are no different. They like things just fine the way they are and resent Trump’s boorish, arrogant style. He said some nasty things to several of the Senators during the presidential primary so there’s a bit of payback going on. In addition, if Trump’s agenda gets passed and is successful he might be re-elected and a few of these fellows still lust after the Presidency and they don’t want to wait seven more years for a go. Trump has had no legislative successes. The GOP attempts to repeal and replace ObamaCare failed and the tax cut proposals will likely suffer the same fate. GOP defections are the problem. The only accomplishment was the confirmation of Gorsuch to the Supreme Court. The Democrats did not fight hard on that one because he was replacing a conservative. The next one will be a battle royal. All other successes for the new Trump administration have been by Executive Orders. He approved the Dakota Access and Keystone XL pipelines; permitted fracking; allowed energy development on public lands and ended the war on coal by repealing the Obama Clean Power Plan. In addition, Trump pulled out of the Paris Climate Agreement, the Global Climate Change Green Fund and the Climate Investment Funds, all expensive sops for the global warming crowd. Trump’s EPA also voided the Waters of the US rule, an Obama-era power grab that essentially put every ditch and wet spot in the US under federal jurisdiction. Good riddance. Government jobs outnumber manufacturing jobs. 9,890,000 people work for the government. So far in 2017 13,000 federal jobs have been eliminated but 7,000 state and local jobs added. Trump’s businessmen oriented cabinet has also been chopping away at the deadwood in the big government bureaucracies. Trump wants to cut $54 billion out of the government agencies. According to a Scientific American article (3/16/17) the Trump budget proposes cutting funding to the EPA by 31%, the Energy Department by 5.6%, Interior by 12% and the State Department by 28%. Former Exon CEO Tillerson and now Secretary of State is finishing up a reorganization plan for State that will seriously downsize this bloated agency. As everyone can understand, anyone facing the ax from their cushy job is unhappy about what Trump is trying to do. It is no wonder that the Administration leaks like a rotten wooden boat. It will be fascinating to see whether Trump or the alligators win this one. I’m betting on the alligators.